Where to go in Paris; outdoor edition! If you’re looking for a guide to some of the prettiest outdoor attractions to visit in Paris… Read on! Often times when you search “where to go in Paris” the typical sites like the Louvre museum, Orsay museum, and the Opera house are sure to be the first destinations that pop up. Now don’t get me wrong, these attractions are definite must-sees, however, sometimes people forget that there is more to Paris than just museums and monuments. (plus they are typically crowded with tourists!) So where to go in Paris you ask? Well, if the weather permits, definitely check out this post to learn more about the exquisite parks and gardens this marvelous city has to offer! If you’re wondering where to go in Paris, my first suggestion is the Luxembourg gardens. 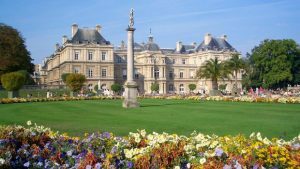 Not only are the Luxembourg gardens absolutely stunning, they also possess a ton of history! Bordered by two popular areas in Paris, Saint-Germain-des-Prés and the Latin quarter, you will find tons of Parisian’s out for a stroll, bathing in the sun or enjoying a picnic on the lawns. I highly recommend taking the time to visit the Gardens at Luxembourg (for a picnic if you have the time! ), they will NOT disappoint. 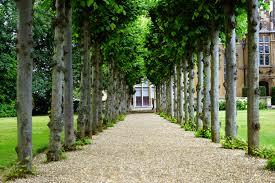 This conventional french garden is full of rows with groomed trees, gravel paths, and lush lawns. Sound a little like a description of Versailles? Well, that is because these gardens were originally constructed by André Le Nôtre for King Louis XIV before he moved to Versailles. When this transition occurred, the gardens then became THE place for classy Parisians to take afternoon strolls. Today it is still regarded as one of the best places to walk through as there is so much natural beauty, history, and culture to be observed. 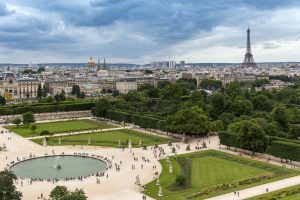 Another cool aspect of these gardens is that it is bordered by some of the most famous destinations Paris has to offer, with the Louvre museum being on one end and Place de la Concorde at the opposite end! 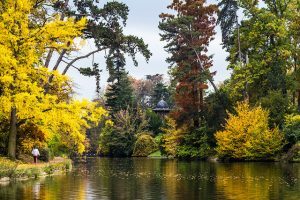 Bois de Boulogne is a massive public park that is located on the outskirts of the 16th arrondissement of Paris. When Napoleon III returned back to France after his period of exile in London, he ordered the area that is now regarded as Bois de Boulogne be ceded to the city for all inhabitants to enjoy. There are claims that this park was inspired by Hyde Park in London. Boulogne is the second largest park in Paris. It has English style gardens, multiple lakes, a zoo..even an amusement park! There are 2 horse racing tracks within the park and it is also home to the Stand de Roland Garros, which is the official stadium for the french open! I guarantee you can find something that sparks your interest within the park, and strongly recommend you check it out! These gardens are located very close to the Louvre, so you might think they’d be crowded, yet they are never heavily flooded with tourist. This makes the gardens a fantastic pit-stop before or after visiting the Louvre. 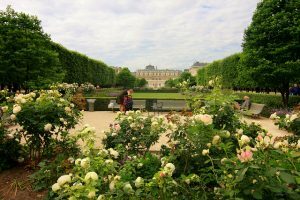 One interesting fact is that they are the only gardens in Paris that have earned a “remarkable garden” classification from the French Ministry of Culture. So if you are really into exploring France’s natural beauties, this is a garden to stop by. Another bonus is that with the gardens comes the “Palais Royal” which translates to Royal Palace. It was originally built for Cardinal Richelieu and regarded as the Palais Cardinale in the 17th century, however, due to conflict of power, it was renamed as the “Palais Royal” for Louis XIII.